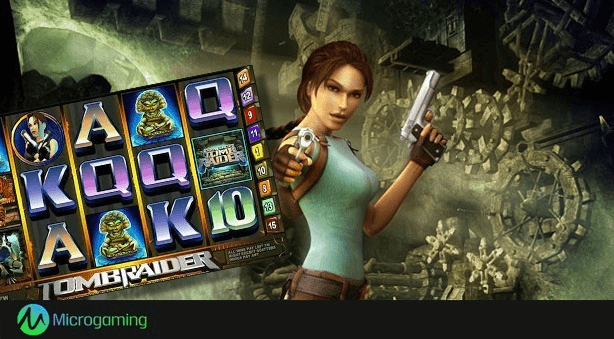 Tomb Raider is well known pokies game from Microgaming where you can see the adventure of Lara Croft. In this 5-reel, 15-payline video pokies there are two bonus features and the jackpot of 7 500 coins. The graphics of the Tomb Raider pokies is very nice and comics-like. On the reels you will see Lara Croft, some weapon, the idol, the game logo, the tiger and A to 10 card symbols. You can play this game for free or with real money at online casinos. On the reels of the Tomb Raider you will see its Logo icon, which is the Wild symbol with traditional substituting functions. The main hero Lara Croft is the Scatter symbol with the highest payout of 400 coins and the ability to activate the free spins round. Also you will get 10 free spins at the 3x multiplier in the Tomb Raider bonus game. The good news is that you can play more free spins, when at least three Lara Croft Scatters appear on the reels. Many of free penny pokies with bonus features have the so-called Click Me games. The entertaining and rewarding Tomb Bonus of this pokies is one of them. As atleast three Idol Bonus symbols will open the access to this round, where you can click on three idols to win your coin prizes.